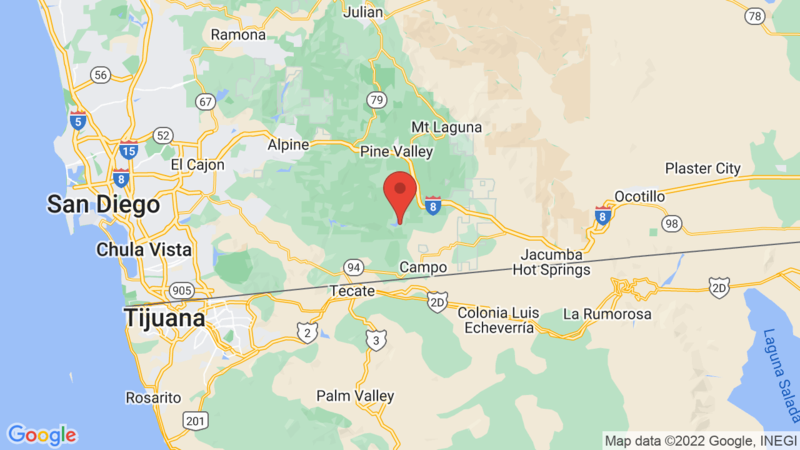 Lake Morena County Park Campground has 86 campsites set among a grove of large oak trees in Southern San Diego County southwest of the Laguna Mountains. There are 58 sites will electric and water hookups. In addition there is a camping area for walk/bike-in campers, a youth camp area (up to 48 people), and there are ten small cabins for rent. The campground has flush toilets, hot showers and a dump station. Each campsite has a table, fire ring and grill. Check in time is 2pm and check out is 12pm. Lake Morena County Park is located in East San Diego County about 42 miles east of San Diego in the Laguna Mountains at an elevation of 3,000 feet. The lake’s water level fluctuates drastically, but still supports boating (onsite rentals) and fishing. Check with the San Diego Park – Lake Morena website for current status. There are fees to bring/launch your own boat, as well as to fish. The park includes 3,250 acres of chaparral, oak woods and grassland to explore. Outdoor recreation includes hiking, biking, fishing, boating, horseshoes, and wildlife viewing. Swimming is not permitted in the lake. There are also large picnic/day-use areas ($3 per vehicle to park). The large group picnic area is $105 per day (50 people max). A group pavilion is also available for rent (call the Park for pricing: 858 565-3600). Day use hours are sunrise to 1/2 hour before sunset. Visted Lake Morena County Park Campground lately? We'd love to hear about your adventure. Did you find us useful? Did we forget something? 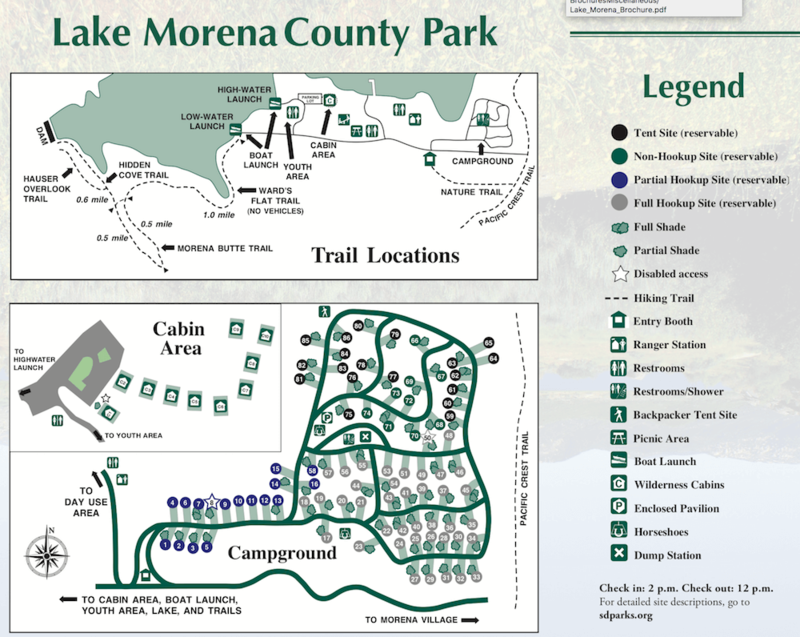 Anything our community should know before heading out to Lake Morena County Park? I need information for a Picnic day in October 27 only. The price is for car or for people. Thank you. The large (group) picnic area is $105 per day. There’s also a group pavilion available for rent, but you should call the Lake Morena County Park directly for pricing; 858 565-3600. You can click HERE for more information, availability and pricing. I’m interested finding out the availability and cost of the Youth Campground at Lake Morena. I would like to make a reservation for Friday night, April; 26 – Saturday afternoon, April 27. I’m not seeing an option for making that reservation for the Youth Camp on the website. From our Lake Morena County Park campground page (this page), click on the ‘Make A Reservation’ button and you will be routed to San Diego County Parks website. From there, choose ‘Lake Morena’, the date you want to arrive, # of nights, and then click ‘Check Availability’. All of the available sites will show up for the date you select.. The Youth Group campsite is the last one listed (if it is available). I experimented with a random date (Feb 18 / 1 night) and it showed up as available. I also inserted your date and it did not show as available so it is reserved for April 26-27.